Did You Know that ITA has New Import Trends and Data? Natalie Soroka is an economist in the Office of Trade and Industry Information within the International Trade Administration. She focuses on international trade statistics and trends, as well as the impact on the domestic manufacturing sector. In promoting U.S. trade interests, it can be easy to forget about the other side of the coin: imports and their importance as inputs to U.S. manufacturers and exporters. Early last year the Census Bureau started to include state-level merchandise import data with their monthly data release, which is now also available on our TradeStats Express platform. Similar to the state export series, this resource can be used to explore state-level trends in goods imports going back to 2008. For example, in 2010 New York’s main import was precious stones and metals, most of which consisted of diamonds from Israel, India, Belgium, and South Africa. As far as trends over time, as you would expect state imports generally declined across the board in 2009. However, two states bucked the trend and actually increased their imports: Kansas and Utah. In Kansas’ case, this increase was nearly all due to high mineral fuel imports, which then dropped the following year (causing Kansas to be one of only four states that saw goods imports decline in 2010). As for Utah, in 2008 the state reported increased imports of precious stones and metals, as well as aircraft. In 2010 imports largely rebounded nationwide, except in four states: Delaware, Kansas, Wyoming, and Maine. Delaware showed the greatest decline, which was largely due to a steep drop in imports of mineral fuel. In 2008, mineral fuel accounted for more than a third of Delaware’s goods imports, but has since dropped 89 percent, accounting for only 5 percent of goods imports in 2010. Speaking of fuel, many states rely heavily on oil and gas imports, importing higher than the general nationwide average share of nearly 15 percent. In particular, oil and gas account for more than half of total goods imports in five states: Montana, Louisiana, Hawaii, Wyoming, and Mississippi. 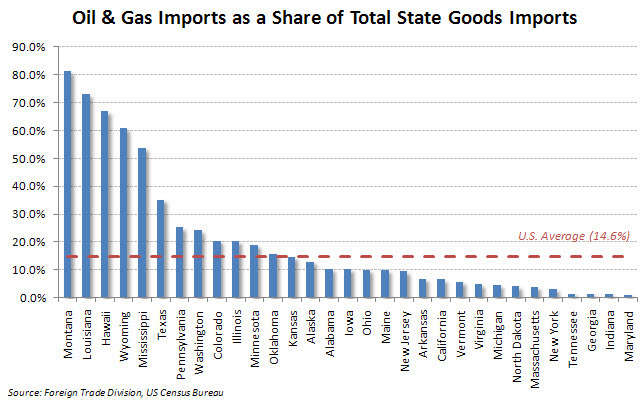 On the other side, two states did not directly import any oil or gas in 2010: Rhode Island and West Virginia. Twenty percent of companies engaged in trade both import and export. In addition to the state import series, this past April the Census Bureau also started to release data on U.S. importing companies. 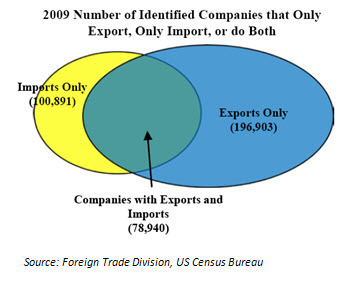 In addition to highlighting the characteristics of companies that imported in 2009, this release also shows that for U.S. businesses, exports and imports are not mutually exclusive, with a sizeable portion both exporting and importing in 2009. For more information on state import trends and U.S. importers, check out ITA’s Trade Statistics webpage.